As a teacher, you’ll come across hundreds – if not thousands – of students during your career. Each student will be unique and each will have slightly different needs in order to excel in the classroom. On a day-to-day basis, you’ll do your best to get the most out of your students by asking tough questions and engaging their minds. Most of your attention will be devoted to teaching a lesson, motivating students, and maintaining discipline, however, you’ll also have an opportunity to observe the physical health of your students. Teachers usually refrain from assessing their student’s physical health. After all, this is the job of parents, guardians, and the school nurse, right? In most cases, the answer will be yes, but what if there are subtle hints of health issues that no one is noticing? I was one of those students who showed telltale signs of allergy throughout my education, yet it was never addressed. My family didn’t recognize my symptoms, nor did my doctors. I grew to learn that my allergy symptoms were just “my normal” and I tried to ignore how uncomfortable I felt. Allergies and asthma are on the rise. According to WebMD, 40% of children have some form of allergy (food or environmental) and every day more children are being diagnosed. While many allergies are food-related, others allergies occur from the environment and include pollen, dust, pets, molds. Both food and environmental allergies can be tough to discern. In this article, I’ll share my personal experience as a student and teacher, and I’ll share the signs you might see in your students. Let’s get started. In the classroom, I was always sleeping and had trouble paying attention in class. I attributed my fatigue to working hard with sports. I experienced seasonal eczema but it was diagnosed by my doctor as a skin condition and not allergy-related. As my symptoms progressed and gradually became worse, I saw multiple specialists and finally visited an allergist. 20 years later I was diagnosed with allergies after reacting to 100 things on my environmental allergy test. Could this explain why I was always tired in class, why my skin always felt uncomfortable, or why I had trouble focusing? I believe the answer is yes! 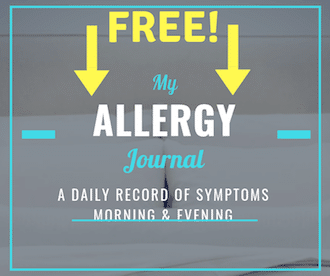 Looking back at my childhood, I know some of my symptoms could have been avoided if I had seen an allergist or received allergy immunotherapy (also known as allergy shots). In those days I didn’t understand why I felt the way I did. My parents and teachers cared about my well-being but I don’t think they realized how bad I felt. Next time you see that student in your classroom that is itching his/her eyes, coughing, or looking exhausted, think about the possibility of allergies and find a tactful way to bring it up in a meeting. Your classroom is bound to have a diverse set of students. There will be straight-A students who attend class every day and there will be struggling students who are often absent. You’ll have control over what occurs in your classroom, but you’ll never be sure of the support your student have at home. Students who don’t have support may lack people in their life who can recognize allergy symptoms. Even those students who have plenty of support might not be familiar with the vast array of allergic symptoms. You might be the person that notices a health issue that no-one else sees! Believe it or not, your classroom is full of allergens. We can’t see them but they’re in the air and we breathe them constantly. Below are a few specific ways to assess the potential allergens in your classroom. In elementary schools, it’s common for classrooms to have a pet hamster or snake. I had them and loved being able to learn about them and handle them. Little did I know that they were probably making me ill.
It’s okay to have pets in your classroom but be aware there may be students who are sensitive to them. If you notice students who have chronic cold-like symptoms, they might be allergic to pets. Even a minor allergic response could affect their learning and behavior. Carpets are the worst possible flooring for allergies. The tiny hairs in carpets capture dust, pollen, and pet dander. Once they land on carpets, allergens work their way down into the carpet. Even the best vacuums will have trouble removing them. If you’ve ever removed an old carpet you’ll know what I mean (there will be plenty of dirt and dust under the carpet). You might be thinking “we have someone who vacuums”. Unless it’s a vacuum with a HEPA filter it won’t be removing allergens. HEPA filters are made to capture the smallest of allergens from a carpet. If the school vacuum doesn’t have a HEPA filter it’s merely blowing allergens around your room. Fans work great to cool us off on hot summer days, but they can also work against people with allergies. Fans tend to stir up allergens and keep them airborne. As an allergy sufferer, I hated fans and I’d avoid sitting near them in classrooms. If you see a student with allergy-like symptoms when the fan is on he/she might be sensitive to the dust in the air. This is a big one! I always felt ill in classrooms that had an HVAC running. The doors and windows of the classroom would be shut and forced air would circulate. Using a heating or cooling furnace is unavoidable during the summer and winter, but it’s wise to ask your school about the type of filter they are using (my article on the best furnace filters). Poor-quality filters don’t do a good job of capturing filters from the air and could be a problem for everyone’s health inside the classroom. According to the Environmental Protection Agency, indoor air quality can be 2-5 times worse than the air outdoors. This is of particular concern at schools where you and your students will be spending a lot of time indoors. What type of cleaning chemicals does your school use to clean the rooms? As a teacher, you should know this and be aware that chemicals can affect your students. Chemicals are usually a trigger, not an actual allergy, but they can cause an immune system response. They can also trigger asthma. If you notice a cleaning chemical smell in your classroom and observe symptoms of coughing or wheezing from a student, ask them if your class is the only place they experience symptoms. Sometimes a few questions can help narrow down the cause. Here’s where things get tricky. Allergic disease affects each person in a different way. One student in your class may sneeze when inhaling an allergen while another may get itchy. In addition, some students might display multiple symptoms from a single allergen. There are symptoms that are more common and there are less noticed symptoms that people don’t understand. In the list below, I’ll share a few of the common signs of allergy and other symptoms I experienced that many people overlook. Sneezing is one of the most common symptoms of allergy. But it’s not just allergies that cause sneezing. Everyone, even those with well-performing immune systems will occasionally sneeze so don’t be surprised if you see every student sneeze throughout the school year. An occasional sneeze shouldn’t be cause for concern, however, if you notice a student is sneezing every day it’s wise to investigate the cause. A persistent runny nose or a stuffed up nose are both strong indicators of allergy. Remember these symptoms will present over a long period of time, not just a day or two. Coughing is a similar response as sneezing. We all cough, but there’s a particular type of cough that may indicate an allergy. A dry, chronic cough, or clearing of the throat could be a result of an allergy. Throat clearing is often caused by post-nasal drip (fluid moving from the sinuses to the throat) and a cough could be due to inflammation or irritation. Itchy or watery eyes are also signs of an allergy. I experienced these symptoms when a fan or air conditioning blew air around the room. A good HVAC filter can help reduce the number of allergens in the air and improve the air quality. If you see a student constantly wiping tears from their eyes, or if you see signs of redness around the eyes and nasal inflammation (hay-fever) then ask that student if there’s anything you can do. If the student doesn’t know the problem you can suggest that it might be an allergy. Eczema is common among kids and often children outgrow their eczema (it just goes away on its own). Eczema can be influenced by both environmental and food allergies. If you observe eczema around the eyes, nose or mouth it could be due to something in the air. Eczema is also common on the arms, legs, and hands. For years I didn’t realize that my eczema was exacerbated by my allergies. If the student can identify the allergy it could result in eczema clearing up! Teachers should also be aware of the following indicators of allergy. These symptoms aren’t usually viewed as being connected to allergy, but they were for me. Do have students that don’t seem to be getting enough sleep? Sometimes it’s because they are staying out late while other reasons are because they are studying. But if your student has a chronic stuffy nose or itchy skin, it may be affecting their quality of sleep. I believe a congested nose prevented me from breathing out of my nose while I slept. Once I received allergy treatment, my fatigue vanished. This would have a significant impact on energy and alertness in the classroom. My mind often felt foggy and I would get distracted and overwhelmed easily. It wasn’t because I was thinking too much, rather it was because I wasn’t sleeping well and my ears, nose, and eyes were congested. If students in your classroom have a tough time staying on task, it might be because they feel unwell. Kids who show signs of allergy may not be confident. If they aren’t feeling well it’s hard to blame them for being depressed. They might not know why they feel down, but if they have other physical symptoms it may be affecting how they are thinking. Depression is a common and serious issue in schools and it can be linked to health issues the student is experiencing. There’s no doubt teachers play an important role in their student’s lives. As a teacher, you’ll get to know your students well over the course of a year. You’ll discover their academic strengths and weaknesses and you’ll help prepare them for the next step in their education. Your perspective as a teacher will include much more than just education. You’ll observe patterns in behavior and you’ll likely be able to discern the health of your students. Because you spend so much time in your classroom you should be fully aware of its health impacts. Your classroom may have carpets, air conditioning, fans, and class pets (the furry kind). 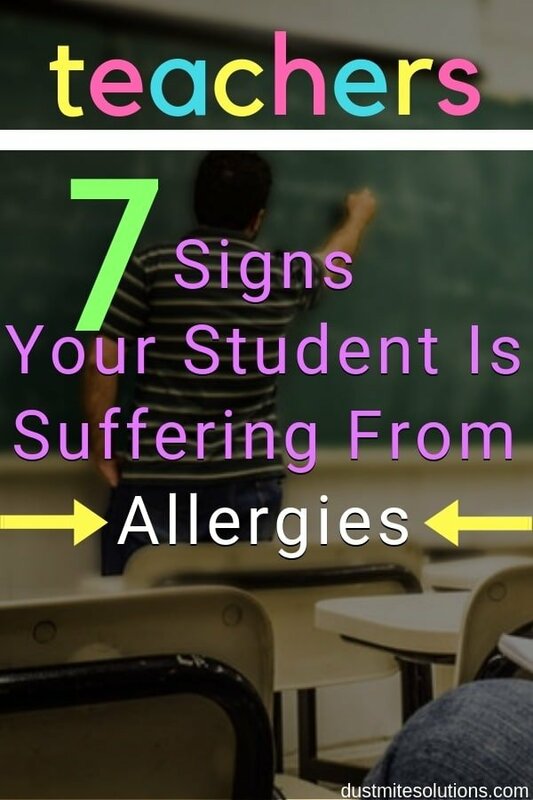 Some of these things can wreak havoc on your students with allergies and these students might be unaware they have allergies. Students will get colds and occasionally get sick but chronic symptoms are a sign of something more serious. Look for signs of allergy over a period of time and you may notice things including a long-term stuffy nose, allergic shiners that don’t go away, irritated eczema, or a very tired student. Be tactful in asking your student questions or bringing up your concerns to their guardians. The student and his/her family might not realize that allergy is a possible cause. When I was a student I certainly didn’t understand my symptoms and I wish a teacher would have mentioned something if they recognized my allergy symptoms. Please share this article with your fellow teachers. A healthy student will be more alert and active in class. Healthy students will make your life as a teacher easier as well!